Two Americans walked away with the titles for the first time in the eight-year history of the Olympus US Open Series, with Serena Williams claiming the women’s title and Mardy Fish cruising to the men’s crown. Serena entered the summer season having never won a US Open Series event since its debut in 2004 and having played just two tournaments in the past year due to injury and illness, but she wasted little time getting acclimated to the North American hard courts. She won the first women’s Series event of the summer in Stanford, Calif., and adding a second title two weeks later in Toronto to hold off Carlsbad, Calif., champion Agnieszka Radwanska and Cincinnati champion Maria Sharapova for the 2011 crown. Fish, meanwhile, won the men’s title with room to spare. He entered four Series events and reached at least the semifinals in each, with a victory in Atlanta and runner-up showings in Los Angeles and Montreal. In all, he outpaced second-place finisher Novak Djokovic by 60 points, the largest gap between the top two finishers in men’s Series history. 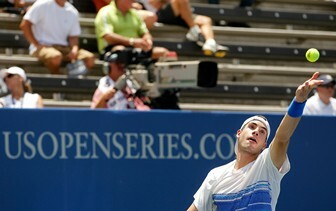 John Isner placed third.